Peatlands are an important component of Canada’s landscape, however there is little information on their national-scale net emissions of carbon dioxide [Net Ecosystem Exchange (NEE)] and methane (CH4). This study compiled results for peatland NEE and CH4 emissions from chamber and eddy covariance studies across Canada. The data were summarized by bog, poor fen and rich-intermediate fen categories for the seven major peatland containing terrestrial ecozones (Atlantic Maritime, Mixedwood Plains, Boreal Shield, Boreal Plains, Hudson Plains, Taiga Shield, Taiga Plains) that comprise > 96% of all peatlands nationally. Reports of multiple years of data from a single site were averaged and different microforms (e.g., hummock or hollow) within these peatland types were kept separate. A new peatlands map was created from forest composition and structure information that distinguishes bog from rich and poor fen. National Forest Inventory k-NN forest structure maps, bioclimatic variables (mean diurnal range and seasonality of temperatures) and ground surface slope were used to construct the new map. The Earth Observation for Sustainable Development map of wetlands was used to identify open peatlands with minor tree cover. The new map was combined with averages of observed NEE and CH4 emissions to estimate a growing season integrated NEE (± SE) at − 108.8 (± 41.3) Mt CO2 season−1 and CH4 emission at 4.1 (± 1.5) Mt CH4 season−1 for the seven ecozones. Converting CH4 to CO2 equivalent (CO2e; Global Warming Potential of 25 over 100 years) resulted in a total net sink of − 7.0 (± 77.6) Mt CO2e season−1 for Canada. Boreal Plains peatlands contributed most to the NEE sink due to high CO2 uptake rates and large peatland areas, while Boreal Shield peatlands contributed most to CH4 emissions due to moderate emission rates and large peatland areas. Assuming a winter CO2 emission of 0.9 g CO2 m−2 day−1 creates an annual CO2 source (24.2 Mt CO2 year−1) and assuming a winter CH4 emission of 7 mg CH4 m−2 day−1 inflates the total net source to 151.8 Mt CO2e year−1. This analysis improves upon previous basic, aspatial estimates and discusses the potential sources of the high uncertainty in spatially integrated fluxes, indicating a need for continued monitoring and refined maps of peatland distribution for national carbon and greenhouse gas flux estimation. Canada is second only to Russia in peatland area ; this extensive area provides many important ecosystem services such as water storage, wildlife habitat, and carbon (C) sequestration . 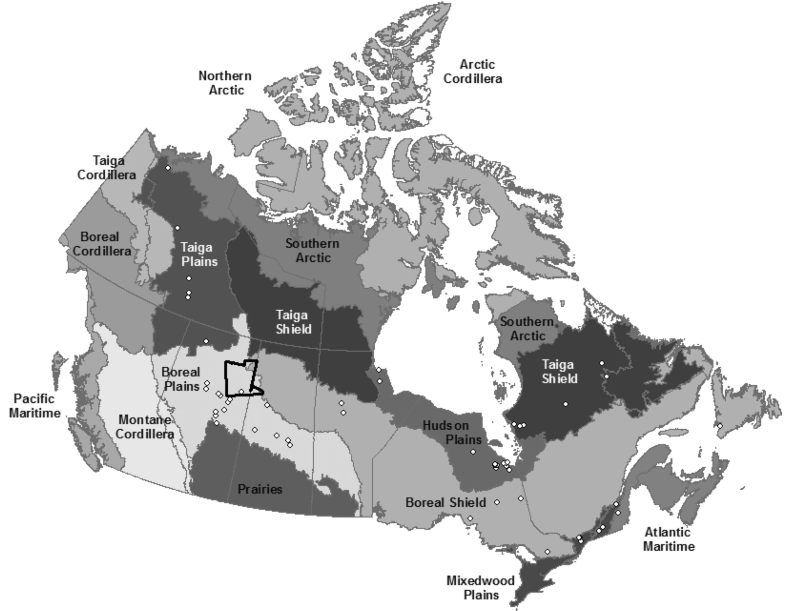 Across Canada, peatlands are estimated to store 103–184 Pg C . Tarnocai  estimated the organic C pool of Canadian peatlands to be 147 Pg, of which 67% occurs in the Boreal and 30% in the Subarctic peatland regions . Canadian peatland soils store 60% more C than that stored in forest biomass and soils . The C stored in peatlands represents the balance between above and belowground net primary production and decomposition in both the upper, periodically aerobic (acrotelm) peat layer and the underlying, anaerobic (catotelm) peat layer. In general, peatlands have much lower productivity than other natural ecosystems and peat accumulation is controlled by cool, wet conditions that limit decomposition . The importance of peatlands in the C balance of Canada and the globe has been recognized for decades  but we still have a limited understanding of the spatial distribution of peatlands relative to forest ecosystems and their net greenhouse gas (GHG) balance at a national scale, despite a relatively sophisticated understanding and modelling capacity at the plot level (e.g., ). This knowledge gap in the national peatland GHG balance must be addressed to satisfy growing international pressure for better GHG estimation and reporting of organic soils on managed lands [e.g., Intergovernmental Panel on Climate Change (IPCC) Supplement to the 2006 Guidelines for National Greenhouse Gas Inventories: Wetlands (Wetlands Supplement—IPCC ). The two existing estimates of national GHG emissions from peatlands in Canada [6, 11] used the Peatlands of Canada database [12, 13] and a single net C accumulation or CH4 emission factor for all peatlands. The net C accumulation (or sequestered CO2–C) rate for both was assumed to equal the estimate of the average long-term apparent rate of C accumulation (LORCA) over the last six to eight thousand years of 20–30 g C m−2 year−1 (i.e., uptake of 73–110 g CO2 m−2 year−1) [8, 14–17]. 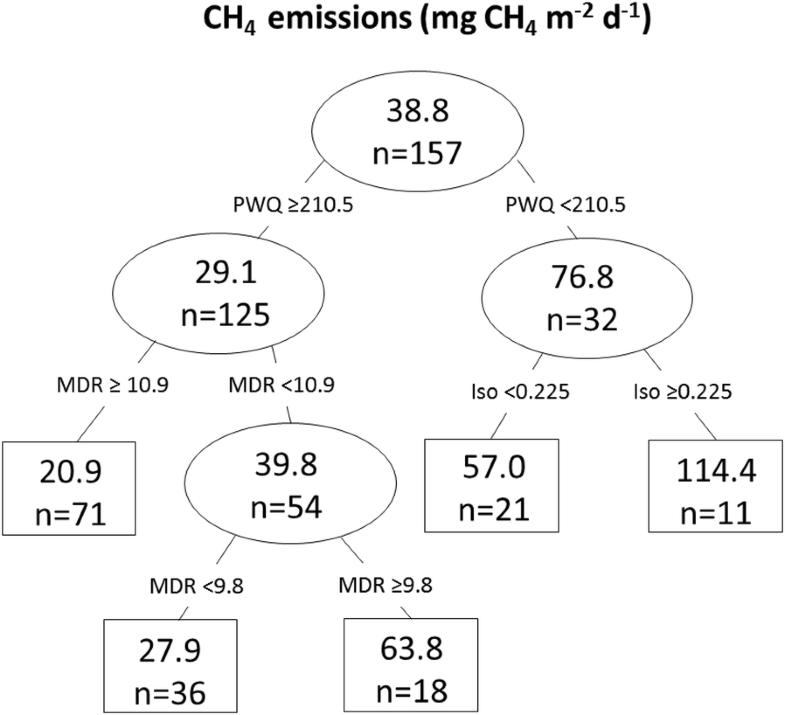 The CH4 emission rate was determined by expert opinion to be 0.8 g CH4 m−2 year−1 (Tarnocai, pers comm) in Kurz et al. and to be 2 g CH4 m−2 year−1 from an average of published studies  for Roulet . Multiplying the peatland area from the Peatlands of Canada database (1.1 × 106 km2) by emissions, Kurz et al. estimated for the year 1986 a Canada-wide peatland net C sink of 96.0 Mt CO2 year−1 and a CH4 release of 0.75 Mt CH4 year−1. Roulet  arrived at a similar Canada-wide estimate for a net C sink of 91.6–135.6 Mt CO2 year−1, but a higher estimate of CH4 release of 2–5 Mt CH4 year−1 [6, 18]. The Peatlands of Canada Map (PCM; [12, 13]) was developed using the Soil Landscapes of Canada (SLC) database , which contains soil information for each polygon based on reconnaissance soil survey. It includes other soil types that occupy a small area, such as Folisols which are upland organic (folic) materials, generally of forest origin, that are greater than 40 cm in thickness . 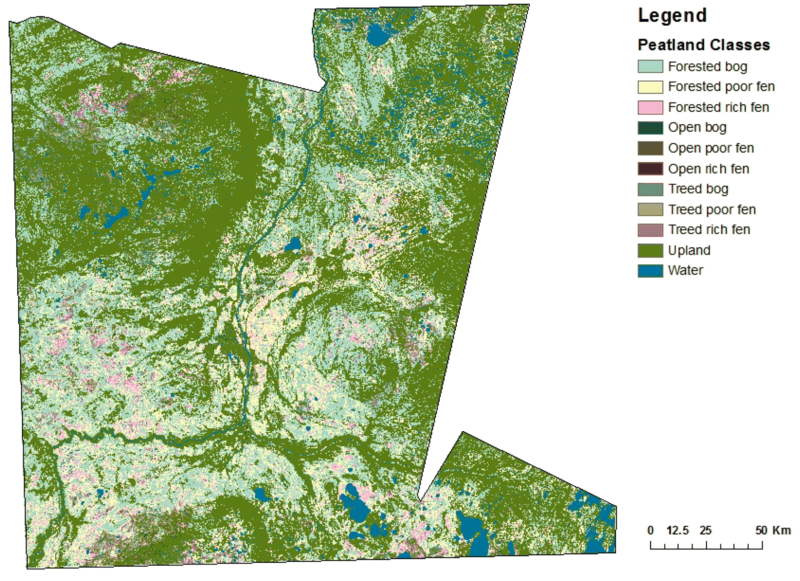 This polygon-mapping product depicting proportional peatland areas of differing classes in Canada at the 1:1 million scale has been available for some time (e.g., [21, 22]) and was based on air photo interpretation and manual delineation. The lack of high-resolution functional peatland maps has been identified as a barrier to proper regional estimates of peatland C exchange . The PCM does not identify key functional differences in peatland types. For example, fens occur along a nutrient gradient  with rich-intermediate fens having different C dynamics than poor fens (e.g., [24, 25]), yet these categories are not differentiated in the map. Another key functional difference not included in the PCM is the degree of tree cover (i.e., open, treed vs. forested). The importance of canopy cover in net CO2 exchange is evident in the close to doubling of annual NEE in bog and fen systems with higher leaf area index . Even within rich fens, a higher canopy cover is indicative of drier surface conditions and therefore smaller CH4 emissions . In the past 20–30 years there has been a large increase in the number of plot-based studies measuring NEE and CH4 emission rates across different peatland types and in different ecozones in response to the need for better understanding of the controls on C cycling within peatlands (Fig. 1). These studies range from single measurements at a single site over a short time period using chamber measurements, to short-term chamber studies done at many sites (e.g., Northern Wetland Study [NOWES; ) to multi-year studies using eddy covariance (EC) techniques across a network of sites (e.g., Fluxnet Canada , Boreal Ecosystem-Atmosphere Study [BOREAS; ). These studies have been focused on a range of scientific questions including: process-based hydrochemical controls on gas fluxes, local scale influence of microforms (e.g., hummocks and hollows), experimental manipulations of temperature and water table, and intra- and inter-annual variability in C emissions. The results of these studies have shown that environmental factors such as water table [31–34], soil temperature [35, 36], mineral nutrient and soil salinity [37–39], and vegetation biomass and type [36, 40] likely have strong controlling effects on temporal and spatial variability in NEE and CH4 emissions from peatland ecosystems. The purpose of this study is to: (1) synthesize available estimates of NEE and CH4 for bogs, poor fens, and rich-intermediate fens for each of seven major peatland containing ecozones in Canada, (2) create a new 250 m resolution, raster-based peatland map synthesized from existing national landcover and forest structure maps and compare it to the polygon-based PCM , (3) provide new national estimates of CH4 and NEE emissions and the net greenhouse gas balance using the synthesized data combined with the new map, and for comparison combined with the PCM and, (4) investigate potential bioclimatic drivers of emissions of CH4 and NEE. The literature was surveyed and researchers contacted to find studies (Fig. 1) conducted within Canada that measured NEE and CH4 emissions (Additional file 1). A total of 52 papers and several unpublished data sets were assessed, resulting in 66 values of NEE and 157 values of CH4 fluxes. These values were synthesized from many more measurements. For sites with multiple years of measurement, the most recent study that reported the most measurement dates was used and averages of plots and/or microforms were calculated across years. If values for microforms were reported separately, they were used in this analysis as separate values in order to capture the variability in fluxes from the peatland. If provided, for each data source information, was recorded on: year of study, months of measurement, ecological type, microtopography, pH, measurement method (chamber or EC), dominant plant functional types, average hourly, daily, seasonal and annual NEE and CH4 flux. For the purposes of this paper peatland types were classified as rich-intermediate fen, poor fen or bog either by using the classification provided in the study or, if none was provided, classification was based on data provided for pH or dominant plant functional types. Fens were defined by the presences of geogenous water, with rich-intermediate fens having high pH (≥ 5.5) and dominated by true mosses, while poor fens have a lower pH (< 5.5) and are dominated by peat mosses . Bogs are ombrotrophic, having drier surface conditions, and are dominated by oligotrophic Sphagnum species of mosses . We recognize that swamps and marshes are also important wetlands types, and that in some regions of Canada these wetland types contain thick organic layers which may meet the Canadian peatland definition . Permafrost is also an important feature within peatlands, affecting GHG dynamics. However swamps and marshes and permafrost peatlands they are not included in this analysis, but will be the focus of future work. A scaling factor of five was determined using studies from the literature that reported both daily and seasonal NEE. The scaling factor is required to make the relationship between observed daily NEE and daily calculated from seasonal NEE 1:1 (r2 = 0.62, p = 0.001). The scaling factor helps to account for NEE that occurs in the shoulder seasons therefore avoiding under prediction. When only annual NEE values were reported, seasonal NEE was determined using an assumed rate of 1.0 g CO2 m−2 day−1 [based on an average of winter CO2 emission rates reported from the literature (Table 1)] for the non-growing season period (i.e., 365-GS) before converting to a daily rate as explained above. When only annual CH4 values were reported, seasonal CH4 was determined using an assumed rate of 7 mg CH4 m−2 day−1 [based on an average of winter CH4 emission rates reported from the literature (Table 2)] in a similar manner as describe for NEE. Default (Tier 1) emission factors for annual peatland CO2 and CH4 emissions presented in the IPCC Wetlands Supplement were developed by assuming non-growing season emissions equaled 15% of growing season emissions (15% of ecosystem respiration for CO2). However, growing season ecosystem respiration data was not available for most of the Canadian studies. For the studies that did have ecosystem respiration, there was a good relationship (r2 = 0.87, p < 0.001) between annual NEE calculated where the non-growing season emission was estimated as 15% of ecosystem respiration, and where it was estimated using 0.9 g CO2 m−2 day−1 for non-growing season days. To be consistent with the method for NEE the constant daily CH4 rate was used, and there was also a good relationship between annual CH4 estimated by calculating the non-growing season emission as 15% of the seasonal CH4 emission, and calculating it using 7 mg CH4 m−2 day−1 for non-growing season days (r2 = 1.0, p < 0.001). Global warming potential (GWP) was calculated by converting CH4 to CO2 equivalents (CO2e) using a factor of 25 over a 100 years time horizon and then adding the estimated CO2e from CH4 to NEE, acknowledging the GWP approach is not the full story in considering the net radiative forcing of peatland ecosystems over longer time scales. Differences among peatland types and regions were assessed using ANOVA or ANOVA on ranks (if normality criteria not met) in SigmaPlot v12.0 . The new peatlands map (250 m pixel resolution) contains nine peatland categories (open, treed, and forested for each of the peatland types of rich-intermediate fen, poor fen, and bog) to accommodate future spatial peatland C modelling with the Canadian Model for Peatlands . The updated peatlands map was created based on the forested peatlands map created by Thompson et al. by combining forest composition and structure information with the National Forest Inventory (NFI) k-NN mapping product from Beaudoin et al. , bioclimatic variables (mean diurnal range and seasonality of temperatures) and ground surface slope. Of the two models presented in Thompson et al. , the raster product using the boosted regression tree method  was used, and a threshold model output of 0.5 (Fig. 2) was set for the classification of treed and forested peatlands. The Canadian National Hydro Network , vector layers of open water bodies was used to mask out water bodies. 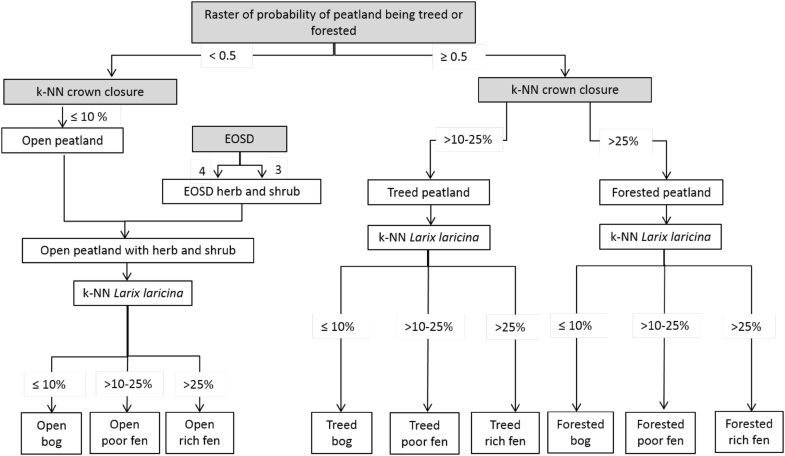 Since the k-NN map includes only peatlands with significant tree cover, the Earth Observation for Sustainable Development of Forests (EOSD; ) map of wetlands was used to identify open (both shrub, herb, or moss cover only) peatlands with only minor (< 10% canopy closure) tree cover. The original 30 m resolution EOSD product was resampled to 250 m using the majority resampling technique and reprojected to the k-NN grid. The NFI k-NN layer for tamarack [Larix laricina (Du Roi) K. Koch] was used to further differentiate bogs, poor fens, and rich fens (Fig. 2), as the proportion of tree cover as tamarack increases from zero in ombrotrophic bogs to 100% in rich fens [50, 51]. Bogs were mapped in areas where the proportion of tree biomass as tamarack was less than 10%, though in true ombrotrophic bogs the proportion is close to zero . This larger margin of tamarack takes into account the uncertainty in the prediction of tamarack in the k-NN dataset . Accordingly, pixels were designated as poor fens when tamarack content was 10–25%, and rich fens when tamarack cover was over 25%. For the C flux analysis presented here the nine peatland categories are reduced to three (rich-intermediate fen, poor fen, and bog) since there was insufficient information given in the surveyed GHG studies to accurately classify them in more detail (e.g., vegetation cover). Evaluating the accuracy of the new peatlands map is problematic given the lack of detailed ground-truthed peatland maps containing all nine peatland types. Several different approaches were used to evaluate the map accuracy. First, the total area of peatlands estimate by the PCM and the new peatlands map were compared. Then the new peatland map was overlain by the PCM polygons to calculated percentages of peatland types (collapsed to only bog and fen categories) based on the new peatland map to compare with the same percentages from the PCM for each polygon. The new peatlands map was also qualitatively evaluated by cross-referencing the new map to the geographic locations of the reported CO2 and CH4 flux studies. Finally, for a small region in northern Alberta, ground validation points collected by Ducks Unlimited Canada (DUC) were used to evaluate accuracy in predicting peatland categories. 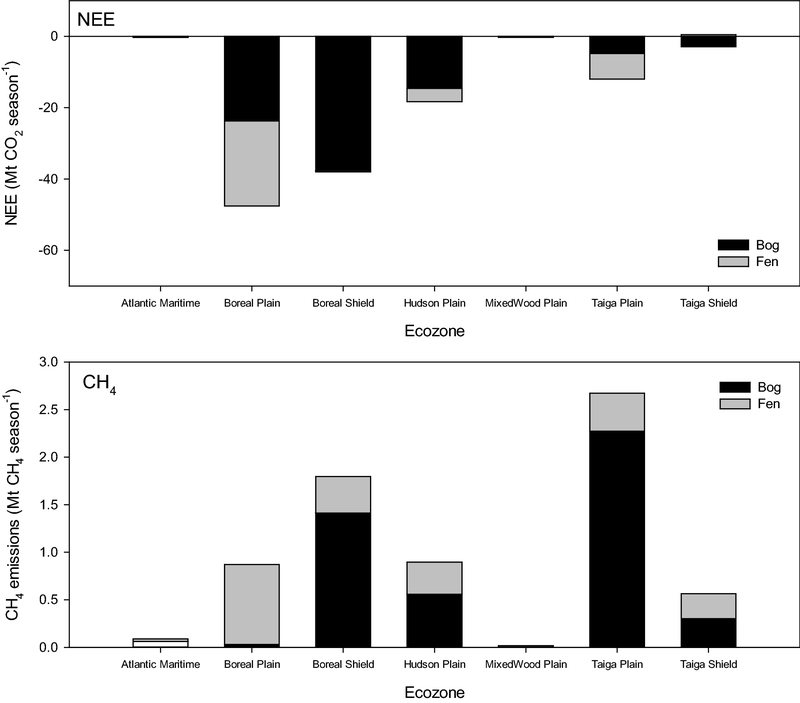 To spatially scale site NEE and CH4 emissions for the seven major peatland containing ecozones within Canada average daily NEE and CH4 emissions for each ecozone were converted to seasonal NEE and CH4 emissions using an average GS for each ecozone, by reversing the method described in “NEE and CH4 emissions” section. Seasonal integration was chosen since many studies, with the possible exception of eddy covariance studies, are only done for the growing season. Annual integration is also presented using a constant daily emission of CO2 and CH4 for the non-growing season, acknowledging there is incomplete knowledge and high uncertainty regarding winter emissions. Two spatially-integrated estimates were calculated. For the first estimate, hereafter referred to as the Peatlands of Canada approach, seasonal ecozone averages of NEE and CH4 emissions for bog and fen (average of poor and rich-intermediate fen) were applied as emission factors to peatland areas from the polygon-based PCM for the seven major peatland-containing ecozones. Areas of different peatland types were calculated by multiplying the percent peatland type by polygon area and summed to provide estimates for each ecozone. Where there were no NEE and CH4 emissions for a peatland type and ecozone combination or no standard error (SE) could be calculated (i.e., n = 1), the emission or SE for that peatland type in the most similar ecozone was used. For the second estimate, hereafter referred to as the new peatlands map approach, seasonal ecozone averages of NEE and CH4 emissions for bog, poor fen and rich-intermediate fen for each of the seven major peatland-containing ecozones were applied as emission factors to peatland areas from a newly created raster-based peatland map. Poor fens and rich-intermediate fens were treated separately in the second estimate because they are differentiated in the new mapping product, but not in the PCM. A tree regression approach was used to examine relationships between climate and peatland NEE and CH4 emissions from the studies, using a suite of bioclimatic factors extrapolated for each of the study locations from a national climate surface interpolation model [300 arc-second (~ 10 km)] . The suite of bioclimatic factors included: mean temperature, total precipitation and length of growing season for annual and warmest quarter of the year, mean diurnal range [mean of all the weekly diurnal temperature ranges (maximum–minimum)], isothermality (mean diurnal range divided by the annual temperature range), temperature seasonality (temperature coefficient of variation), annual temperature range, precipitation seasonality (precipitation coefficient of variation), start day of growing season (Julian day of mean daily temperature that was greater than or equal to 5 °C for five consecutive days beginning March 1) and end day of growing season (Julian day of minimum temperature less than − 2 °C beginning August 1st ). The tree regression was run using Rpart library within R  using the bioclimatic factors along with peatland type as the predictor variables and daily NEE or CH4 emissions as the response variables. The tree regression used the ‘anova’ method and default values for rpart.control arguments. In the tree regression, the coefficient of determination (r2) is calculated as 1-relative error. Summarizing the studies examined, most of the NEE measurements were from bogs and the least from poor fens (Table 3). For CH4 emissions, both bog and rich-intermediate fens were well represented, with fewer studies reporting on poor fens (Table 3). Studies existed for at least one peatland type within each of the seven ecozones (Table 3). 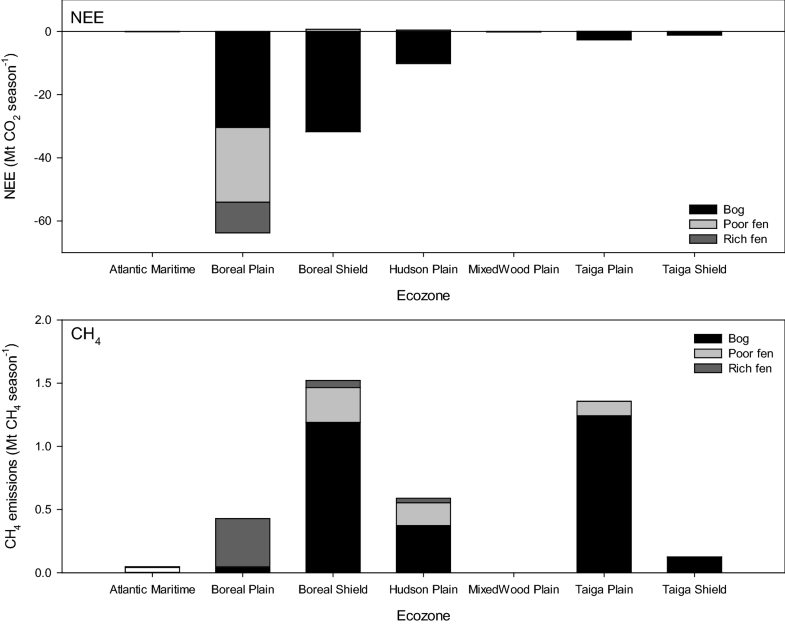 The Atlantic Maritime was the least represented, with only NEE and CH4 values for bogs. The Boreal Plains, Boreal Shield and Mixedwood Plains were best represented having studies for NEE and CH4 for all peatland types occurring within the ecozone. Hudson Plains was missing poor fen NEE and CH4, Taiga Shield was missing bog and rich-intermediate fen for NEE and Taiga Plains was missing poor fen for NEE. Daily average growing season NEE and CH4 emissions varied greatly within each peatland type (Table 3) and there was no statistically significant differences among peatland types. Daily NEE and CH4 emissions varied among ecozones for each peatland type, but sample sizes were too small to conduct statistical tests (Table 3). For bogs and both types of fen, NEE ranged from a strong sink (− 8.6 to − 12.5 g CO2 m−2 day−1) in Boreal Plains bogs and fens to a weak source (0.3 g CO2 m−2 day−1 and 0.4 g CO2 m−2 day−1) in Taiga Shield and Boreal Shield poor fens. However, some peatland types were represented by only a single or very few measurements in several ecozones. For CH4, emissions ranged from relatively small (0.9 mg CH4 m−2 day−1 from Boreal Plains poor fens) to large (> 100 mg CH4 m−2 day−1), with largest emissions from Taiga Plains for bogs (124.2 mg CH4 m−2 day−1) and poor fens (165.3 mg CH4 m−2 day−1). As with NEE, sample size was small for CH4 emissions for several of the ecozones. Combining ecozones into temperate (Atlantic Maritime and Mixedwood Plains), boreal (Boreal Plains and Boreal Shield) and subarctic (Hudson Plains, Taiga Plains and Taiga Shield) regions showed a trend of daily NEE from temperate < subarctic < boreal (p = 0.17). For CH4 emissions there was an interaction (p = 0.06) with region with bog < fen emissions for temperate (p = 0.03) and boreal regions (p = 0.04), and for fens subarctic < boreal < temperate (p = 0.05) (Table 4). The PCM [12, 13] and the newly created raster based peatlands map estimated different peatland areas (Table 5). The total bog and fen peatland area nationally was 11 × 105 km2 for the PCM while the new peatlands map estimates an area of 7.3 × 105 km2. In both maps the total peatland area for the seven dominant peatland-containing ecozones represented in this study (Atlantic Maritime, Mixedwood Plains, Boreal Shield, Boreal Plains, Hudson Plains, Taiga Shield and Taiga Plains) comprise 96% (for PCM) and 98% (for new peatlands map) of bog and fen peatland area in Canada (i.e., all 15 ecozones). The PCM had more bogs in the Taiga Plains, Taiga Shield, Boreal Shield, Atlantic Maritime, Mixedwood Plains and Hudson Plains than the new peatlands map, but the new peatlands map had more bogs in the Boreal Plains than the PCM. For fens, the outcome was the same with the PCM having greater areas of fens in all ecozones except the Boreal Plains. Both maps predicted a higher percentage of bogs than fens (66% bog, 34% fen for PCM; 73% bog, 27% fen for new peatlands map). The percentage of polygons where the new peatland map and the PCM were in good agreement for proportion of peatland types within polygons was high (Table 6A with 79% of polygons predicting within 1 category (in 10% intervals) of the 1:1 line. Results for fens were better (Table 6B), with 89% of polygons predicting peatland type percentages within 1 category of the 1:1 line. Generally fen and bog categories matched between the two maps (i.e., bogs were found where there was no fens and vice versa) (Table 6C and D). Cross referencing the new peatlands map to geographic locations of the reported studies (data analysis not shown) showed that bogs were accurately identified as bogs. Sometimes forested or treed and open were confused although we often did not have enough information to evaluate the degree to which the study site was treed versus forested. Fens were less accurately identified, often being classified as bog. Even if accurately identified as fen, there was confusion between rich-intermediate and poor fen and open versus treed/forested fen. This validation is qualitative at best because geographic coordinates from the data source may have had rounding errors, and the projection system for the coordinates was unknown. Additionally, because the resolution of the k-NN map product is 250 m, differentiation of small peatland types would not be possible. Comparing the new peatlands map (Fig. 3) to the ground-truthed data collected by DUC for a portion of the Boreal Plains in northern Alberta (Table 7), showed an overall accuracy of 38%. There is some confusion with neighbouring peatlands on the gradient, but also some confusion between upland and peatland areas. Using the PCM, NEE (± SE) for the seven major peatland-containing ecozones was calculated as a sink of -118.9 (66.4) Mt CO2 season−1 and CH4 as an emission of 6.9 (± 4.1) Mt CH4 season−1 (Table 8A). Using the new peatlands map, the sink was calculated as − 108.8 (± 41.3) Mt CO2 season−1 and CH4 as an emission of 4.1 (± 1.5) Mt CH4 season−1 (Table 8B). Converting CH4 to CO2e (multiplication by the global warming potential of 25 for CH4) resulted in a CO2e emission of 172.6 (101.4) Mt season−1 for CH4, and thus a net source for peatlands in Canada of 53.7 (167.7) Mt CO2e season−1 using the PCM. While using the new raster peatland map, the CH4 CO2e was 101.8 (36.4) Mt season−1 resulting in a net sink of − 7.0 (± 77.6) Mt CO2e season−1 for peatlands in Canada. Poor fens contribute most to the net source status being a moderate NEE sink but a small CO2e source. Bogs had large NEE but high CH4 resulting in a near neutral net emission (− 0.8 ± 63.8 Mt CO2e season−1) and rich fens were small sinks that were offset by CH4 emissions resulting in a small source (1.7 ± 6.1 Mt CO2e season−1). Using the PCM the Boreal Plains peatlands made the largest contribution to the national NEE sink (− 47.6 Mt CO2 season−1) and Taiga Plains peatlands contributed most to the national CH4 emissions (2.7 Mt CH4 season−1) (Fig. 4). Using the new raster peatlands map, Boreal Plains peatlands were also identified as the largest contribution to the NEE sink (− 63.8 Mt CO2 season−1) while and Boreal Shield peatlands contributed most to national CH4 emissions (1.5 Mt CH4 season−1) (Fig. 5). For an annual estimate of emissions we assumed, based on the average of several studies that have quantified winter CO2 and CH4 emissions (Tables 1, 2), a non-growing season emission of 0.9 g CO2 m−2 day−1 and 7 mg CH4 m−2 day−1. By including non-growing season CO2 emissions, the peatlands switch from a sink of − 118.9 to a source of 80.2 Mt CO2 m−2 year−1 using the PCM, and from a sink of − 108.8 to a source of 24.2 Mt CO2 m−2 year−1 using the new peatlands map. Total net emissions including winter CH4 emissions increased from 53.7 to 291.5 Mt CO2e m−2 year−1 for PCM and from − 7.0 to 151.8 Mt CO2e m−2 year−1 for the new peatlands map. Climate factors were slightly better at predicting daily average NEE (r2 = 0.40) than daily average CH4 emission (r2 = 0.29) in the regression trees. The regression tree identified temperature-related factors (isothermality, mean temperature of warmest quarter) along with start date of growing season as key to explaining variation in NEE (Fig. 6). Large negative NEE values (i.e., a sink) occurred where there was high temperature isothermality (≥ 0.255). This category with the largest sink contained primarily Boreal Plains bogs. Positive NEE values (i.e., a source) occurred where there was low temperature isothermality (< 0.255) and earlier start to growing season (< 136.5). This category was the largest source and contained primarily Boreal Shield bogs. The tree regression identified a precipitation-related factor (total precipitation in warmest quarter) and temperature parameters (mean diurnal range and isothermality) as key factors for explaining variation in CH4 emissions (Fig. 7). The highest CH4 emissions occurred from areas with low precipitation in warmest quarter (< 210.5 mm) and high temperature isothermality (≥ 0.225). The categories with the highest CH4 emissions were primarily the rich-intermediate fens of the Boreal Plains. Lowest CH4 emissions were found in regions with high precipitation in the warmest quarter (≥ 210.5 mm) and high mean diurnal range (≥ 10.9). The category with the lowest CH4 emissions was large and composed of bogs and fens from primarily the Hudson Plains and Boreal Shield. In previous studies average annual rates of C accumulation were assumed to be between 20 and 30 g C m−2 year−1 (equivalent to uptake of 73 to 110 g CO2 m−2 year−1) based on the average LORCA over the last six to eight thousand years [8, 14–17]. Based on the averages of compiled seasonal values and seasonal estimates predicted from daily values, we estimate average seasonal CO2 uptake across all studies at 171.6 (± 35.1) g CO2 m−2 season−1, which is higher than the previously reported range, although our estimate for average daily NEE of − 4.3 ± 7.1 g CO2 m−2 day−1 is similar to that reported by Lund et al. for average daily rates of NEE in July of − 4.4 ± 3.2 g CO2 m−2 day−1 for 12 northern peatlands across North America and Europe. The seasonal CH4 emission rate across all studies (6.6 ± 0.7 g CH4 m−2 season−1) was within the range of 1 to 10 g CH4 m−2 year−1 cited by Moore and Knowles  and lower than the average for northern peatlands of 16 (standard deviation ± 28) g CH4 m−2 year−1 . Our average daily rate for CH4 emission (38.8 mg CH4 m−2 day−1) was also lower than mean fluxes for temperate, boreal and subarctic regions (range of 72.7 to 112.2 mg CH4 m−2 day−1) reported by Turetsky et al. . Using the seven major ecozone-specific seasonal emission rates for bogs and fens, we estimate a spatially-integrated seasonal NEE to be − 108.8 (± 41.3) Mt CO2 season−1 for the new peatlands map and − 118.9 (± 66.4) Mt CO2 season−1 for the PCM, which is a similar sink to previous national estimates of Kurz et al. at 96.0 Mt CO2 year−1 and Roulet  at 91.6–135.6 Mt CO2 year−1. The new estimate for CH4 emissions from Canada’s peatlands at 4.1 ± 1.5 Mt CH4 season−1 using the new peatland map is larger than the estimate of Kurz et al. at 0.8 Mt CH4 year−1 and within the range of Moore and Roulet  and Roulet  at 2–5 Mt CH4 y−1, although the PCM estimate at 6.9 (± 4.1) Mt CH4 season−1 is higher than this range. The IPCC Wetlands Supplement provides GHG estimation guidance for international reporting of annual peatland fluxes. However, peatland GHG studies frequently do not include winter observations. It is difficult to assess winter emissions, as they are difficult to measure and they are typically assumed to be negligible. However, many have noted that these winter emissions may in fact not be negligible, particularly since snow covered soil can maintain temperatures much higher than the air temperature, allowing microbial metabolism to continue [56–60]. Using an approach that includes an estimate of winter emissions, the peatlands switched from a sink to a source of CO2 to the atmosphere. The daily rate of 0.9 g CO2 m−2 day−1 for the non-growing season used is larger than the average winter (January) emission rates assessed in northern peatlands across North America and Europe from eddy covariance studies of 0.5 ± 0.5 g CO2 m−2 day−1 . At this lower emission rate, peatlands would be annual sinks and not sources. This analysis highlights uncertainties and knowledge gaps in understanding winter emissions which have a large effect when emissions are temporally and spatially scaled. There are large standard errors on both NEE and CH4 emission estimates. The large errors in these estimates are due to small sample sizes in emission measurements in some ecozones that have large peatland areas (which magnify errors). Other key sources of error are spatial heterogeneity and temporal variability of emission within peatland types, among peatland types and across ecozones as well as error associated with estimating the total area of each peatland type. Furthermore, chamber measurements typically do not include larger shrubs and trees, thus NEE will be underestimated in the studies where these plant functional types are important. Despite the large uncertainty, this estimate improves on previous estimates by stratifying peatlands by peatland type and ecozone. Peatland NEE and CH4 emissions were variable within peatland types. A single peatland is made up of many different microforms, including hummocks, lawns, hollows and shallow pools. It is difficult to generate the proportion of these microforms on a landscape scale. Instead, we accounted for this within-site variability by including microforms as different entries for each peatland type. Some of these features may cover a small area but produce disproportionately large fluxes. For example, NEE from small hummocks dominate CO2 uptake  while shallow pools have high CO2 emissions [60, 62]. For CH4, hummocks have lower emissions, followed by lawns and hollows having the highest emissions . Permafrost (e.g., peat plateau or palsa) or recent thaw features (e.g., new collapse scars and shallow pools), which we could not account for, have even higher CH4 emissions [57, 64, 65]. Less recent permafrost thaw (e.g. collapse bogs) were included in our analysis which may confound trends for peatland types in subarctic areas. This fine-scale heterogeneity translated into large uncertainty in the estimates integrated across the seven ecozones. Net ecosystem exchange and CH4 emissions also varied among peatland types. For NEE, the literature suggests that poor fens should be stronger CO2 sinks than rich fens [24, 25], however our synthesis did not support this observation. Vegetation strongly influences the gross ecosystem production (GEP) and ecosystem respiration (ER) components of NEE with both GEP and ER increasing from open to shrubby to wooded peatlands, correlating to aboveground vascular biomass . It is possible the poor fens, which were under-represented in our analysis, may have been biased towards open systems which are weaker sinks. Additionally, chamber based measurements don’t sufficiently capture uptake of larger shrubs and trees, which would result in underestimation of the CO2 uptake. For CH4, emissions were extremely variable as have been observed in other northern peatlands . Our results were consistent with the general trend noted in the literature that emissions typically decrease along the gradient of fen to bog  for the boreal and temperate ecozones, although this was not the case in the subarctic ecozones. For example, CH4 emissions from bogs were greater than CH4 emissions from fens in the Hudson Plains  and raised bogs and patterned poor fens can have high CH4 emissions where the peat mat is degrading . There also may be a legacy effect in peatlands that have experienced permafrost thaw that could result in elevated CH4 emissions . Vegetation can also modify this pattern among peatland types with treed peatlands having lower CH4 emissions than open bogs and fens , however our study could not quantify this effect. Vegetation, instead of peatland type, may be more important for predicting emissions [55, 66]. However, the studies included in this analysis did not provide sufficient quantitative information on species composition and biomass to evaluate the effect of vegetation. For NEE, the biomass and leaf area index of vascular plants is important for GEP [25, 66]. For CH4, Bubier et al. showed that bryophytes are a better predictor of emissions than vascular plants (e.g., shrubs), while sites with graminoids (e.g., Carex sp.) have also been found to be good predictors . Shrub cover can indicate dry areas and low CH4 emissions, although this was only observed in subarctic fens, not in the boreal . 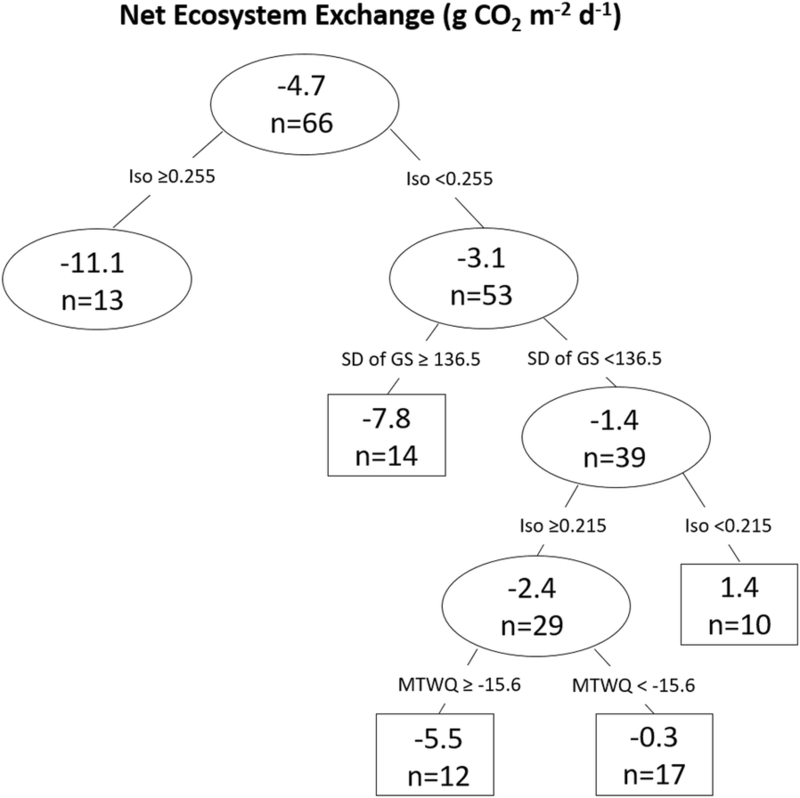 Net ecosystem exchange and CH4 emissions varied across ecozones. The NEE and CH4 trends by bog/fen and climate zone generally agree with values in the IPCC wetlands Supplement and other synthesis studies (Table 4). Previous work showed that among wetland regions , which are similar but not equivalent to ecozones , daily CO2 uptake at boreal and mid-latitude sites was greater than in the subarctic and arctic . Our analysis is consistent with this observation with daily NEE highest in the boreal ecozones, followed by subarctic and temperate ecozones (p = 0.17). For CH4, previous work showed that emissions were lowest from Hudson Plains and Low Boreal followed by southern subarctic, northern subarctic, arctic and highest from the high boreal [18, 70]. However, Turetsky et al. showed CH4 emissions were higher in temperate sites than subarctic and boreal. Our results did not show clear trends across regions when peatlands were combined, but the fen data followed the trend described by Turetsky et al. (p = 0.05, Table 4). On a nationally integrated basis, Moore and Knowles  suggested the majority of the national CH4 flux came from subarctic wetland region fens, whereas our analysis suggests Boreal Shield and Taiga Plains peatlands contribute the most to these emissions. However, few emission measurements in the Taiga Plains combined with the large peatland area introduce large uncertainty in this estimate. Inversion modelling studies of Pickett-Heaps et al. and Thompson et al. have predicted emissions in the range of 2.3 to 3.4 Mt CH4 year−1 from the Hudson Plains. Our estimate for the Hudson Plain of 0.6 Mt CH4 season−1 (or 0.8 Mt CH4 year−1 including winter emissions) is smaller than these recent predictions, but close to an earlier inversion modelling prediction of Roulet et al. : 0.5 Mt CH4 year−1]. However, the area used in the more recent inversion studies incorporates boreal and taiga areas outside the mapped Hudson Plains ecozone, which may contribute to higher estimates from inversion modelling. The limited sample size of ground measurements in the Hudson Plains is an additional source of uncertainty in this analysis. In addition, many studies based on chamber measurements may not fully capture CH4 emissions from ebullition, resulting in smaller emission rates compared to atmospheric concentrations. Our analyses collapsed temporal variability in emissions. Average daily emissions over the growing season was the base unit for scaling and the meta-analysis included different years of measurements over the last 20–30 years. Some measurements were single measurements that may have reflected abnormal climate years. Where multi-year measurements were recorded the average of years was used to reduce the inter-annual variability. Climate conditions within a year are also known to affect emissions. Net ecosystem exchange decreases in dry, warm years and increases in warm and wet summers, reflecting the relative changes in photosynthesis and respiration [56, 59–61, 73]. A warmer, earlier snowmelt in spring and/or a warmer fall can lead to a net source of CO2 due to heterotrophic respiration increasing before photosynthesis begins, or heterotrophic respiration continuing after photosynthesis has stopped [74, 75]. The spring period following snowmelt has been shown, in particular, to have marked variation in NEE [74, 76]. Decreases in water table lower NEE, but increases in water table do not necessarily increase NEE if temperature and photosynthetically active radiation concurrently decrease . For example, wetter conditions affect fens and bogs differently due to differences in the relative contributions of vascular plants and mosses . Methane emissions are sensitive to water table and soil temperature  and tend to increase in warm, wet years . This intra and inter-annual temporal variability can translate into large uncertainty in estimates at a national scale. The regression tree identified potential bioclimatic drivers of the differences in daily emissions occurring at larger spatial scales. The regression tree included peatland type as a predictor but it was not identified as an explanatory variable. This may indicated that vegetation type is more important than peatland type. However, the regression trees did highlight bioclimatic variables such as temperature and moisture (precipitation) known to influence NEE and CH4 emissions. A more thorough analysis with detailed vegetation information related to species, cover and biomass, although not available for this analysis, would be more informative. Future studies should record such information when flux measurements are taken. Despite improvements in understanding the processes driving NEE and CH4 emissions from peatlands our national maps of peatland distribution remain rather simplistic. While local and some regional scale high resolution peatland mapping has occurred (e.g., DUC 19 unit wetland classification; Smith undated) which has taken advantage of advances in remote sensing technology related to detecting peatlands and indicator species, efforts at the national scale have been absent until relatively recently (e.g., ). Efforts to stitch together provincial datasets (Canadian Wetland Inventory; http://maps.ducks.ca/cwi/) have proven challenging due to discrepancies in the peatland categories used. Typically these maps, similar to PCM, do not differentiate fen types, nor do they include percent tree cover. Thus the new peatlands map presented here, synthesized from existing national coverages, is an improvement over the polygon-based PCM. Comparing the new map to the PCM shows a discrepancy in total peatland area, with the new map predicting lower peatland areas than the PCM, although both highlight the dominance of bogs as peatland type. The PCM includes other organic soil types such as Folisols that are not peatland soils, that may have contributed to overestimated peatland areas. The new peatlands map presented here underestimates the area of permafrost peatlands near the treeline, as low digital elevation model slopes were used to detect large flat areas as a predictor in peatland distribution . However, in permafrost palsas, the 1–2 m of uplift surrounding non-permafrost wetlands creates higher slopes that are difficult to distinguish from upland areas. We recognize there are limitations to both the NFI k-NN map product and EOSD datasets that form the basis of our new map, that affected the map accuracy (Table 7), but as new and improved national data layers become available, this product can be quickly and continually refined. The new map, by being raster based and differentiating rich fen from poor fen is an improvement in predicting peatland distribution. The new map also has additional information about vegetation type (including open, treed and forested) and separation of studies into open, treed and forested peatlands, which has been suggested will improve predictions . However, not enough detailed vegetation information was present in most data sources used in this study, thus differentiating woody vegetation influence within each ecozone was not possible. In Canada, significant changes in temperature and precipitation have occurred since the beginning of the 20th century . Significant changes are taking place in seasonal climatic pattern, which are likely to have major impacts on the NEE and CH4 seasonal emissions patterns for different peatland types [79–81]. Warmer temperatures will increase the growing season length. As a simple example, if the growing season length increases by 10% the sink strength of NEE increases (− 118.9 to − 130.8 Mt CO2 season−1 for PCM and − 108.9 to − 119.7 Mt CO2 season−1 for new peatland map). This is consistent with a longer growing season contributing to higher net ecosystem C sequestration . However CH4 emissions also increase (4.7 to 5.2 Mt CH4 season−1 and 4.1 to 4.5 Mt CH4 season−1 for PCM and new peatland map respectively). For this scenario, the net emissions of CO2e increases from 57 to 63 Mt CO2e year−1 using the PCM, and decreases from − 7.0 to − 7.7 Mt CO2e year−1 using the new peatlands map. However, Moore and Roulet  suggest that climate change will likely decrease CH4 emissions due to CH4 production having a greater sensitivity to water table fluctuations than to temperature (i.e. growing degree days), so an increase in CO2e is not likely. The impact of climate change is likely to be even more complicated. Using peatland drainage as a substitute for water table decline with climate change, Strack et al. found that with draining, respiration increased from hummocks, hollows and lawns, while GEP decreased in hummocks, but increased in lawns and hollows. Strack et al. also showed that the response to climate change will depend on the antecedent moisture conditions of the site and succession. Over the long-term, persistent changes to climate and water table will also result in changes in plant communities. Invasion of vascular species with greater leaf area index will increase productivity thus greater photosynthesis will offset increases in respiration . In areas where permafrost is currently present, accelerated thawing with climate change is expected to alter both NEE and CH4 emissions. Permafrost thaw creates wet internal lawns within drier bogs, which will increase respiration of CO2 by 1.6 times and CH4 emissions by 30 times . Despite increases in respiration, there will be higher net C storage within biomass, however net storage will be partially, or completely, offset by increases in CH4 emissions for at least 70 years . After 70–100 years, succession will allow peatlands to act like a thawed bog and be a small sink . Another complicating factor of climate change is the expected change to fire frequencies within peatlands. A fire results in immediate loss of stored C and the peatland becomes a C source . Weider et al. found that immediately after fire boreal bogs in Alberta are a net source, then return to a sink 13 years post fire and reach peak strength at 75 years with a slight reduction in sink strength after 100 years. We present a synthesis of available estimates of NEE and CH4 emissions across Canada and use the PCM and a newly synthesized peatland map to calculate peatland emissions during the growing season from the seven major peatland-containing ecozones. This analysis is the best available to date, but highlights many uncertainties in up-scaling estimates. Combining data sets that used different methodologies, length of study and over different years is challenging. We attempted to maximize use of all data by using GS to standardize amongst daily, seasonal and annual reported values. While the spatial extent for which we have measurements within Canada has greatly increased in the last 20–30 years, some ecozones have few or no observational studies of NEE and CH4 emission in some peatland types. Assumptions had to be made for peatland types in ecozones where there were no studies. Future field studies need to be conducted in areas currently under-represented and even within well represented ecozones more consideration needs to be given to understanding the effect that vegetation differences (particularly the differences among open, treed and forested) have within peatland types. Similarly, microforms within peatlands can have large effects on emissions, but the proportion of the peatland which these landforms cover is often not quantified. Permafrost thaw features and shallow water pools are not explicitly captured in this analysis due to the difficulty in delineating them at a national scale, yet they are known to have large impacts on NEE and CH4 emissions. In addition to uncertainties in emission rates, an added source of error is the incomplete knowledge of the distribution of peatland types within Canada. The Peatlands of Canada polygon-based map, was the best map possible given the technology of 20–30 years ago. Efforts to create a uniform layer or stitch together provincial raster maps of various qualities and containing different peatland types have been slow. We present an improved raster peatland map at 250 m resolution developed by synthesizing existing spatial information. Higher resolution maps containing many different peatland types (e.g., DUC enhance wetland classification) using an assortment of remote sensing technologies have only been prepared over small areas, and this is likely to be an area of continued development in the coming decade. Using remote sensing at a higher resolution will allow us to better predict the vegetation and thus identify key indicator species for peatland types and quantify woody biomass that will be key in improving emission estimates. Climate was identified as an important driver of NEE and CH4 emissions. Temperature and precipitation influence microbial respiration and C turnover, permafrost melt, peat drying and fire susceptibility. Climate changes will be variable across ecozones, and thus it is difficult to predict how national emissions will change under a future climate. Over short time scales it is likely that emissions of CO2 and CH4 will increase with greater decomposition, permafrost thaw and fires, but over the long term may stabilize or decrease if peatlands are completely converted to forested systems (i.e., if all peat the peat burns to mineral soil). The next step in improving national estimates of NEE and CH4 emissions is underway with the development of the Canadian Model for Peatlands (CaMP) . The CaMP is intended to simulate C stock changes and emissions for 11 peatland categories over contemporary (1990 to present) and future (10–100 years ahead) time frames. The CaMP will be compatible with the newest modeling framework of the Carbon Budget Model of the Canadian Forest Sector (CBM-CFS; ) and is designed for application at multiple scales (site level to national level) and for spatially-referenced (polygon based) and spatially-explicit (raster based; ≥ 30 m resolution) modeling approaches. The majority of analysis and writing was done by KW. SN and SH searched the literature for emission factors from peatlands. SN and DT created the peatland map. JB assisted in structuring and editing the paper. CS, KB, SH and WK provided detailed editing of the manuscript. All authors read and approved the final manuscript. The authors wish to thank Ducks Unlimited Canada for use of their ground validation points for a case study area in northern Alberta. The authors wish to acknowledge funding from the Government of Canada’s Expanding Market Opportunities Program in support of scientific research related to the implementation of the Canadian Boreal Forest Agreement (CBFA). 13021_2018_105_MOESM1_ESM.xlsx Additional file 1. 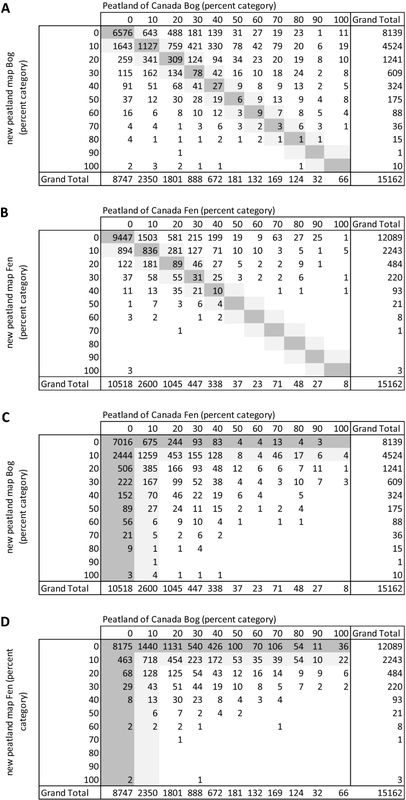 Listing of reported net ecosystem exchange and methane fluxes from Canadian peatlands. Intergovernmental Panel on Climate Change (IPCC). Supplement to the 2006 Guidelines for National Greenhouse Gas Inventories: Wetlands (Wetlands Supplement); 2014. https://www.ipcc-nggip.iges.or.jp/public/wetlands/. Accessed 16 Mar 2015. Tarnocai C, Kettles IM, Lacelle B. Geological Survey of Canada, Open File 6561. Natural Resources Canada; 2011. https://geoscan.nrcan.gc.ca/starweb/geoscan/servlet.starweb?path=geoscan/fulle.web&search1=R=288786. Accessed 13 Aug 2012. Hijmans RJ, Philips S, Leathwick J, Elith J. Package ‘‘dismo”; 2015. http://cran.r-project.org/web/packages/dismo/dismo.pdf. Accessed 20 Nov 2015. Natural Resources Canada (NRCan). CanVec_50K_Hydro_shapefile; 2016. ftp.geogratis.gc.ca/pub/nrcan_rncan/vector/canvec/shp/Hydro/. Accessed Sept 2016. R Core Team. R: A language and environment for statistical computing. R Foundation for Statistical Computing, Vienna, Austria; 2013. http://www.R-project.org/. Accessed 21 Nov 2017.